Semiconductor nanostructures are currently of high interest for a wide variety of electronic and optoelectronic applications. A large number of such devices is based on InAs/GaAs quantum dot structures. 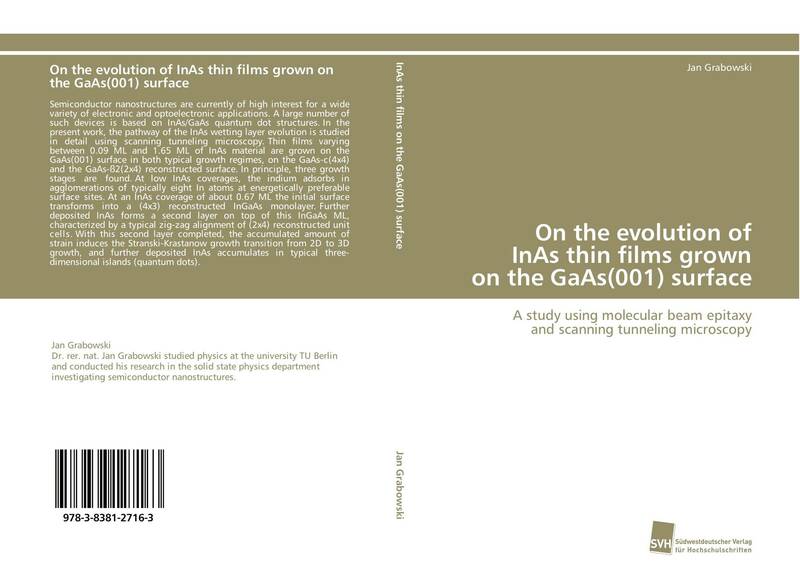 In the present work, the pathway of the InAs wetting layer evolution is studied in detail using scanning tunneling microscopy. Thin films varying between 0.09 ML and 1.65 ML of InAs material are grown on the GaAs(001) surface in both typical growth regimes, on the GaAs-c(4x4) and the GaAs-ß2(2x4) reconstructed surface. In principle, three growth stages are found. At low InAs coverages, the indium adsorbs in agglomerations of typically eight In atoms at energetically preferable surface sites. At an InAs coverage of about 0.67 ML the initial surface transforms into a (4x3) reconstructed InGaAs monolayer. Further deposited InAs forms a second layer on top of this InGaAs ML, characterized by a typical zig-zag alignment of (2x4) reconstructed unit cells. With this second layer completed, the accumulated amount of strain induces the Stranski-Krastanow growth transition from 2D to 3D growth, and further deposited InAs accumulates in typical three-dimensional islands (quantum dots).